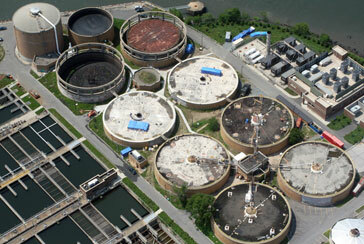 Hunts Point WPCP - Bronx, N.Y.
Jett Industries, a subsidiary of Kiewit Corporation, was awarded the contract for the refurbishment of four digester tank interiors, replacing roofing on the digester and sludge storage tanks and related mechanical work at the Hunt Point Water Pollution Control Plant for NYCDEP. Mechanical work included installation of upgraded polymer chemical feed system, with six blending units, five storage tanks, progressive cavity pumps and 1,200 linear feet of double walled CPVC piping with heat tracing and pipe insulation. The interior and yard piping infrastructure was upgraded and rehabilitated with installation of 5,500 linear feet if 1” to 14” pipe and replacement of 125 plug valve ranging from 6” to 14” requiring asbestos and lead abatement. Digester work included dewatering solids and cleaning out the tanks in order to complete the new interior liners by applying 3,000 linear feet Linabond system. Installation of new digester mixing equipment, gas safety equipment and centrifugal sludge pumps, plunger pump and seal water skid system. Project work also required installation and integration of a new plant wide control system of both existing and new equipment with capability of remote monitoring.